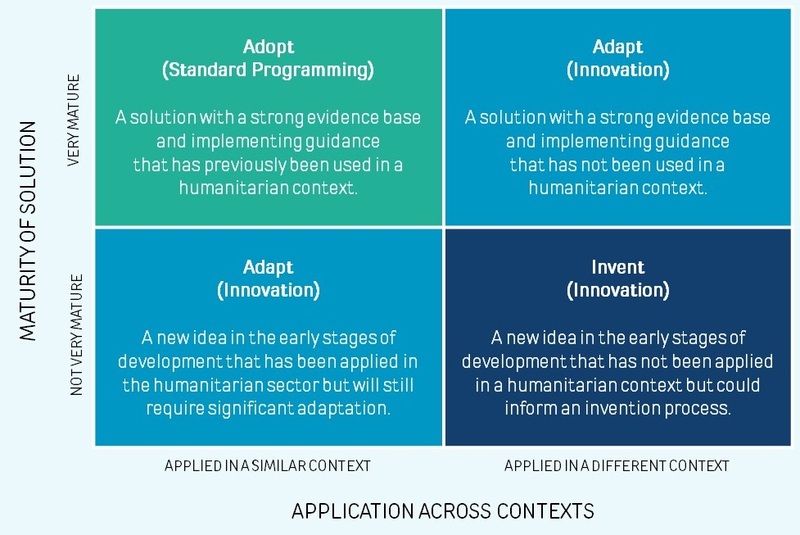 As explained in our More Than Just Luck report, innovations in the humanitarian sector generally come from either a new idea (Invention) or from identifying changes that are necessary to repurpose existing products and services for use in a new context (Adaptation). If you have found what appears to be an appropriate solution to your problem during the Search stage, you will now need to work through the process of adaptation. Every humanitarian intervention will be unique to varying degrees, based on a combination of factors including the distinct capacities and vulnerabilities of those affected, local laws and culture, and the different actors involved in the humanitarian response. Even if a solution has been successfully deployed in another humanitarian context, it is critical to consider different aspects of the solution that might need to be adapted. There is little available information or guidance on the process of adopting and adapting programme models and approaches across different humanitarian sectors and contexts, or how to understand whether evidence for action in one setting can be used to inform decisions about interventions in new contexts. Yet it’s vital for the humanitarian community that we ensure that good solutions are being used as widely as possible, and that good innovations are replicated and scaled. As described in the introduction and shown in the diagram below, we see innovation in organisations as a spectrum of uncertainty, with business as usual at one end and the invention of new products and services at the other. This spectrum of uncertainty can also be viewed as the amount of change that is required in moving away from business as usual, or the amount of learning that is required to successfully navigate that change. 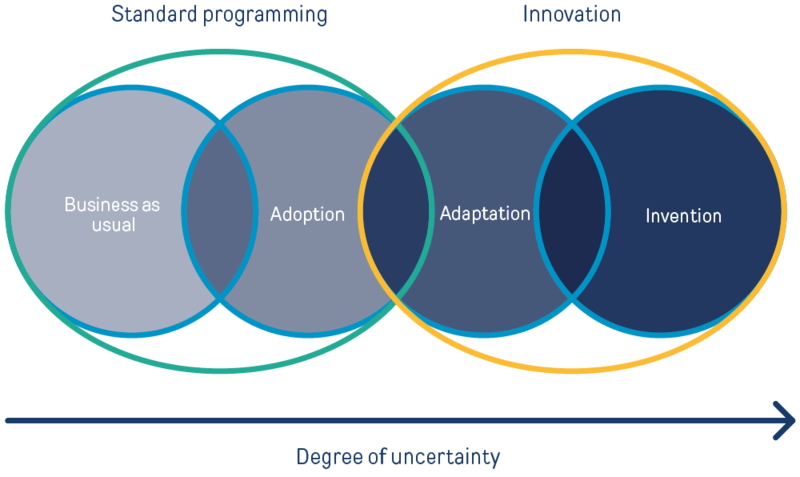 In the middle, the adoption-adaptation spectrum is intended to represent the difference between adopting a product or service model from a similar organisation in a similar context requiring little change (standard programming), and the high level of adaptation necessary when a product or service model is newly introduced to the humanitarian sector (innovation). Every solution that is found, no matter how easy it initially seems to deploy or replicate, will require some change, even if that is simply the organisational change necessary to successfully integrate a new product or approach. However, it is possible that lots of changes will be required, beyond basic changes in your organisation, such as changes to the core components of the solution itself, or to the behaviours of staff, local communities and other stakeholders. Another way to look at this is through a two-by-two table representing the maturity of the solution, and where that solution comes from (see below). Taking on a mature solution from the humanitarian sector is likely to be a fairly straightforward process but taking on a less mature solution is going to require a significant amount of learning and adaptation. Likewise, taking on a mature idea from outside the sector is still likely to require a fair amount of adaptation to repurpose it for humanitarian ends, and taking an immature idea from outside the sector is likely to require a very significant investment of resources and high risk. It is vital to understand how well-developed a newly identified solution is, both in terms of the solution itself and the structures around it – whether mature and stable or new and growing. For the efficient and effective use of funding for humanitarian action we recommend you have a bias towards adopting an existing solution even if it is not fully mature and is itself on its scaling journey. What are the defining characteristics of the context that you are hoping to introduce your solution into? What stage of the disaster management cycle are you aiming to introduce this solution into? What other humanitarian organisations, humanitarian clusters, or local authorities might you need to engage? Is the proposed solution appropriate for target users and the local community, and do you have a good understanding of any protection or data privacy risks that may exist? Does your potential solution impact your ability to adhere to, and be seen to adhere to, humanitarian principles and standards? The following modules will walk you through a process of first assessing the absorptive capacity of your organisation and the adaptation requirements of your solution, before looking at specific adaptations that might be required across three levels: the solution itself, your organisation, and other actors in the context. The activities in this module will help you assess how well your organisation is equipped to absorb new solutions in general, and the degree of adaptation required for your solution, in particular. The activities in this module will help you assess how well your shortlisted solutions match your design criteria, the maturity of your found solutions, and their level of adaptability. The activities in this module will help you assess whether your organisation needs to change any policies, procedures or ways of working in order to be able to apply the solution. The activities in this module will help you assess adaptation requirements of local problem holders, people affected by crises, potential partners and other stakeholders in the ecosystem.